Car accidents occur every day of the year and while the majority of them are minor, there are those that are not. Severe injuries that occur due to a car accident can mean that your loved one is not able to care for themselves or will have a very long recovery process getting back to full function. When an automobile accident is due to the negligence of another person, you deserve to have your medical bills, as well as lost wages, pain and suffering, and loss of function, covered financially. Williams & Thorson, LLP has over 15 years of experience in personal injury law and will help you to get what you deserve. The insurance company that you are dealing with may seem to be all about getting you the compensation that you need. However, they are not working in your best interest. Their interests lie with the company and with paying out as little as possible. Don’t just accept what they say and don’t sign anything that they ask you to sign without checking with your attorney first. You could be signing away your rights for future compensation if you do. The attorneys at Williams & Thorson, LLP know how the insurance companies work and they will work in YOUR interests to get you what you deserve. They and their experts will work in conjunction with each other to create a strong case that will prove your claim. With both legal and medical experience, they understand what to look for in the records and how to deal with the insurance companies. While it will not likely go to court, a case still needs to be built to prove to the insurance company that your claim is strong enough to win in court. They will then, in many situations, offer a settlement, which you can choose to accept or deny. 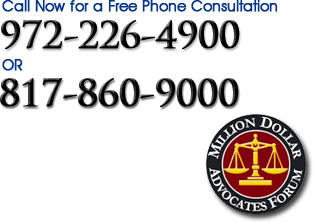 Make no mistake, there are other personal injury lawyers in Garland and in other parts of Texas. However, you will not get the attention and the determination that is needed for you to get the maximum settlement that you deserve. If you or a family member is dealing with a car accident injury due to the negligence of someone else, contact Williams & Thorson, LLP today for a consultation. They will fight for you and for your best interests to ensure that you are compensation for your medical injuries and your losses. Call (972) 226-4900 or (817) 860-9000 to discuss your case.